Toner Components: What’s In Your Toner? 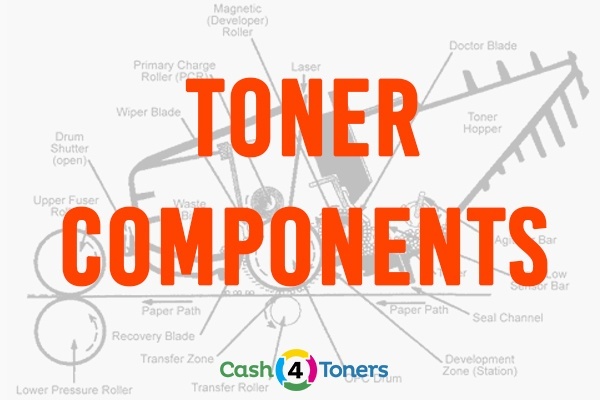 What’s inside that toner cartridge you’re holding? Yes, we know what to do when the printer says the toner is low. But what’s inside that toner cartridge? Yeah, we know it’s dust, but dust from what? The finely powdered plastic in toner cartridges does not conduct electricity but is able to hold a static charge. This means it can be moved around and positioned as an image on a charged drum roller. Also, powdered plastic melts at a very low temperature, which makes fusion with heat and a pressure roller possible. But What’s It Made From? Toner was once — and frequently still— made from plastic slabs that are broken, crushed, and ground down into fine powder using air jet milling. But that can yield unevenly sized particles, which results in less-than-perfect printed images. This led toner manufacturers to “grow” uniform-sized toner particles in a lab. These smaller, evenly sized particles permit better image reproduction and allow more efficient toner use. Ever since early man used crushed berries to paint on cave walls, humanity has sought a better way to express itself through words and art. We needed ink! As early as the 4th century BC, Middle Eastern civilizations made ink from burned bones, pitch, and tar, while the ancient Chinese made ink from fish glue. From squid ink to the development of carbon black — a powdered soot made from burnt tar and creosote — mankind is on a never-ending quest to find a better way to print. We’ve finally found a better type of ink for computer printers. It’s called toner. Unlike ink cartridges, toner cartridges don’t dry out, produce more pages faster, and print sharper text. Xerox engineer Gary Starkweather developed laser printing in 1969 by modifying one of the company’s office copiers. Since then, laser printing is the good-to for high volume printing and low cost-per-page. It may not seem like it when you’re buying OEM toner cartridges, but toner really is a better bargain than ink. Manufacturers use the same basic formulas when making color laser toners. Yellow laser toners contain pigment yellow 180, magenta toners contain pigment red 122, while cyan toners contain pigment blue 15:3. Black laser toners contain carbon black powder combined with powdered plastic. What else is in there? Fumed silica, which keeps the powdered toner particles loose and flowing freely inside the cartridge, and charge control agents — powdered iron, chromium and zinc — which maintain the charge of the particles. Life inside a toner cartridge is indeed a wondrous place filled with magical science and fantastic technology, (as well as several human carcinogens). Plastic dust is the simple answer to the question of what’s in your toner, but the technological advancements that got it there are truly amazing.